When we first walked through this house when we were house hunting last year, I was already pretty geeked about it. Nicely landscaped front yard, fireplace with surrounding built-ins, tons of kitchen storage, AND first floor laundry. These were all features we didn’t expect to find in a home in our price range. 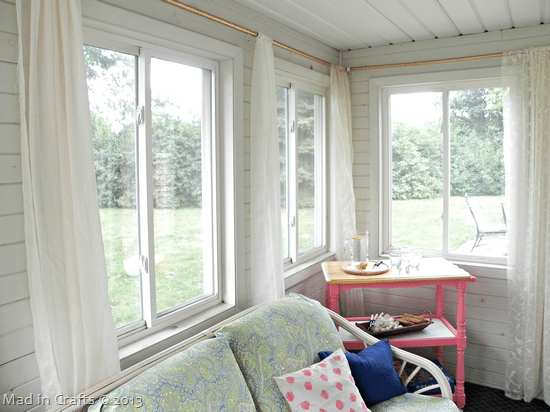 And then there was the unexpected bonus – a sunroom! Although the previous owners were just using it for storage, the room had so much potential. A year later, we were living in The Mad House, and the sunroom was still being used for storage. 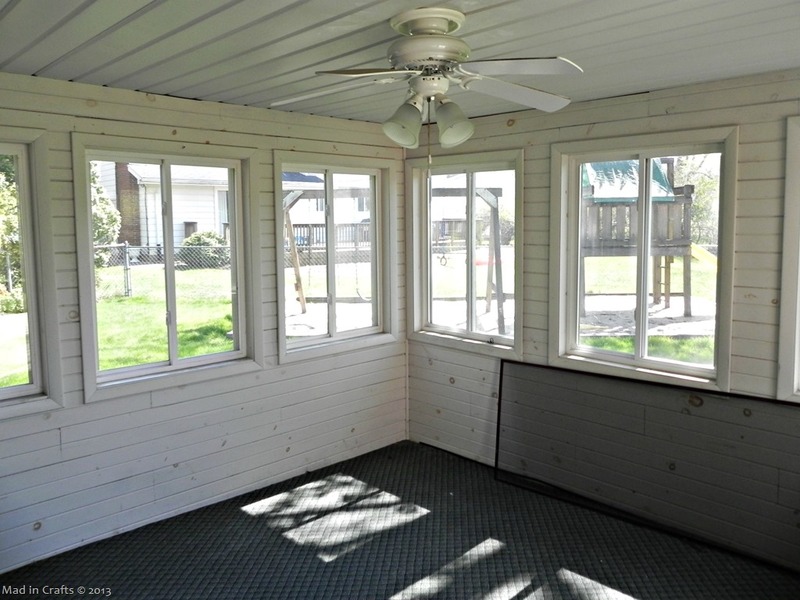 Empty moving boxes, the dog’s crate, extra chairs, it all got shoved in the sunroom. 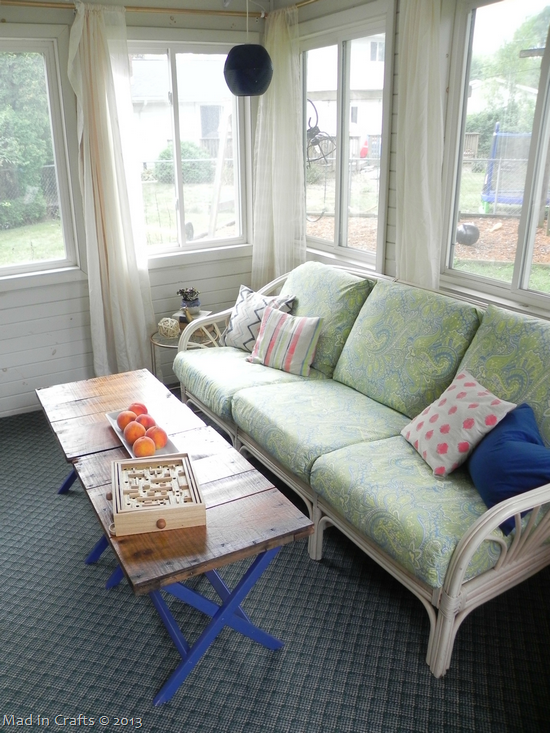 Then, for my birthday, my parents bought us a well-used set of rattan furniture off Craigslist, and that started the domino effect which ended in a lovely makeover for the room that had so much potential. This is the first room I have ever been able to design from scratch. While the room wasn’t quite a white box, the features it did have, like the brick and planked walls, were elements I might have chosen to put in the room if I’d had my choice anyway. Almost every item in the room was some kind of a DIY project, which makes this reveal very personal and exciting. So, long story, short – too late – let’s check out the room! I will take you on a little clockwise tour of the room. I tried a couple of different layouts, but the one that worked best was to have the seating mostly along the walls. We can scoot the chairs in closer to the middle of the room for a more conversation-friendly seating arrangement, if need be. 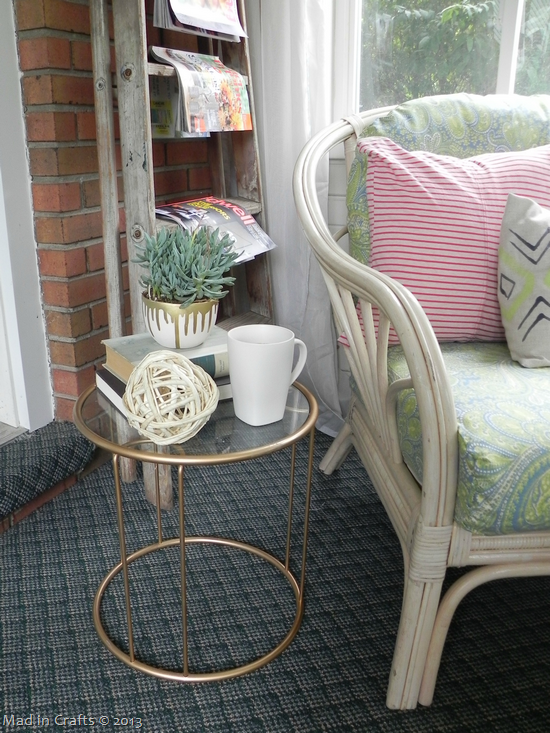 This corner is a perfect spot to sit with a cup of coffee and a few magazines. 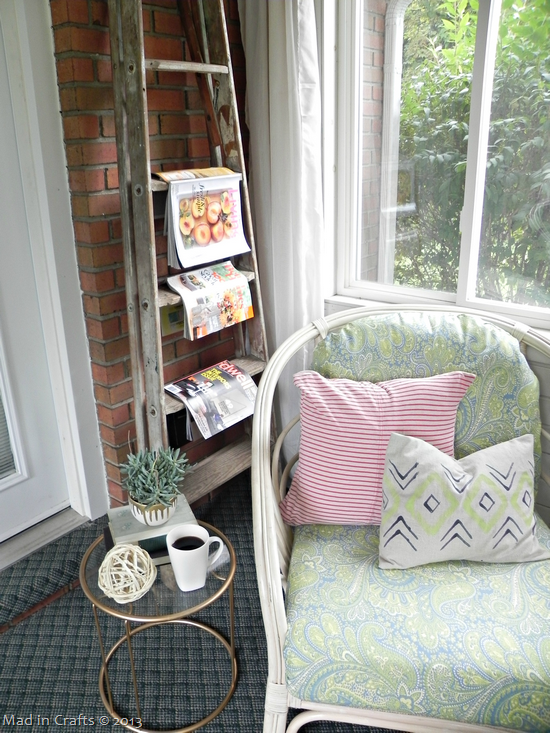 This weathered, wooden ladder was taking up space in our garage, so I was glad to put it to work in the sunroom as a magazine rack. Now it’s being stored AND serving as storage. It’s so meta. One of my new potted succulents hangs out on a glass and metal side table which I found at Goodwill a few months back. This table (and its smaller mate) were originally chrome, but I hit them with some of the same metallic gold spray paint that I used on the curtain rods to make them fit in better with the room. You can also see the first of the six pillows I made for the room. 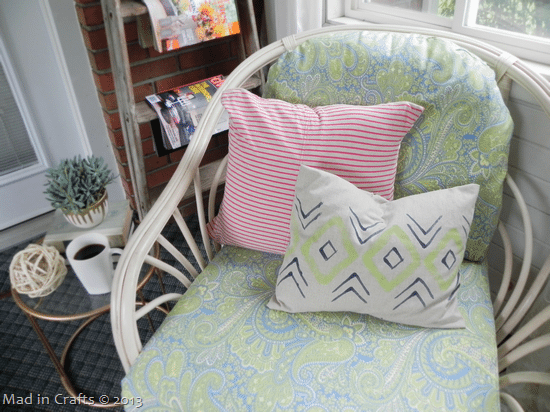 I hand-painted the envelope pillow in front, and the striped pillow is made from an old cotton t-shirt. 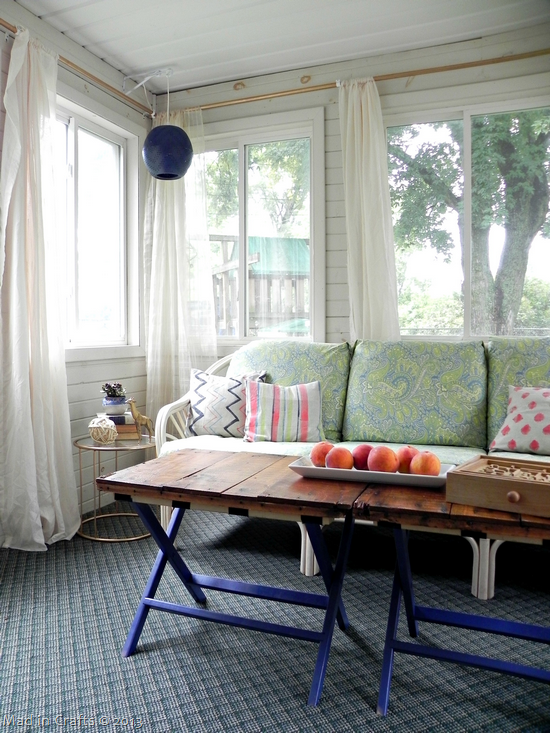 The next stop on the tour of the room is the re-covered couch and X-leg coffee table. The rattan of the furniture is in great shape, but the cushions were pretty rough. My mom spent hours and hours at my sewing machine making new covers for all the cushions using fabric I ordered online. Didn’t she do an amazing job! It took me a while to come up with the coral, blue, green, and navy color scheme, but I think it plays out pretty well in the room. 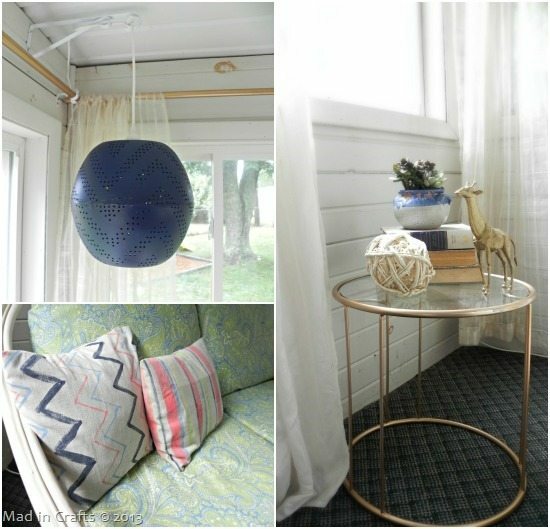 My West Elm inspired pendant lamp found a permanent home in the corner of the sunroom, as did one of my blingie gold animals. 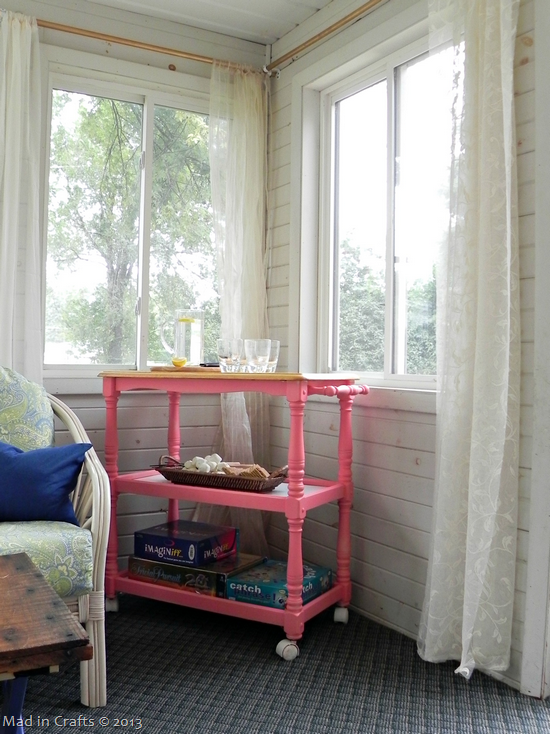 All the decorative accessories in this room makeover were taken from other rooms in The Mad House or were bought at a thrift store. 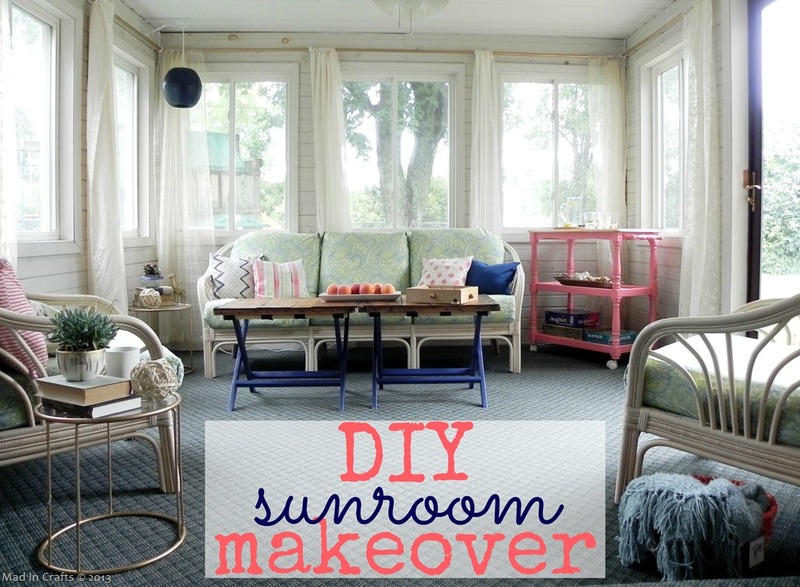 I know that it wouldn’t really be a sunroom without good light, but isn’t the light in there just lovely? While you are looking at that picture, take a minute to check out the carpet. I had really wanted to rip up the carpet in here and paint or stain the concrete underneath. The carpet is kind of dated and not the colors I would have chosen. However, since it’s still in great shape and scraping the adhesive off of the floor would have been a big job, we left it. And look how nice it looks now that everything is in the room! It was a good lesson for me that not everything needs to be redone for it to look new! The two X-leg coffee tables I “built” fit perfectly in front of the new couch. 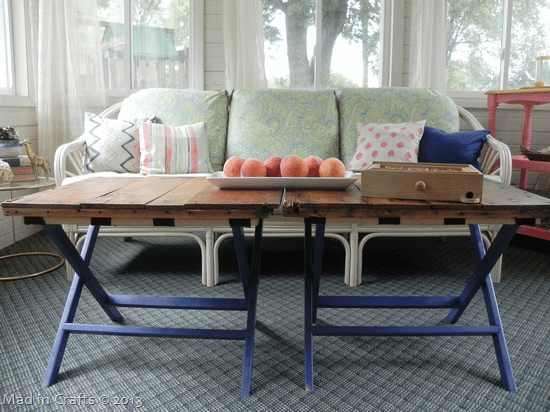 The repurposed crate tabletops bring some needed texture into the room. 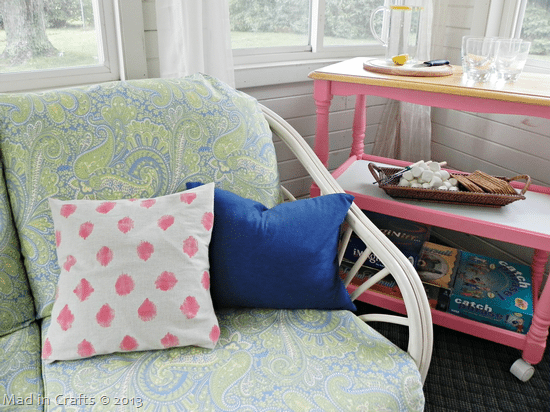 The hand-painted ikat-style polka dot fabric I made was turned into another throw pillow and sits next to one made of an old blue t-shirt that had been sitting in my fabric stash for years. When I was deciding how to style the refinished rolling bar cart for these photos, I perused Pinterest and design blogs and made note of all the glamorous bar carts stocked with cut crystal and top shelf hootch. That kind of styling probably would have made for better Pinterest pics, but it would have been disingenuous. This cart is much more likely to hold s’mores supplies and board games than Stoli and china. 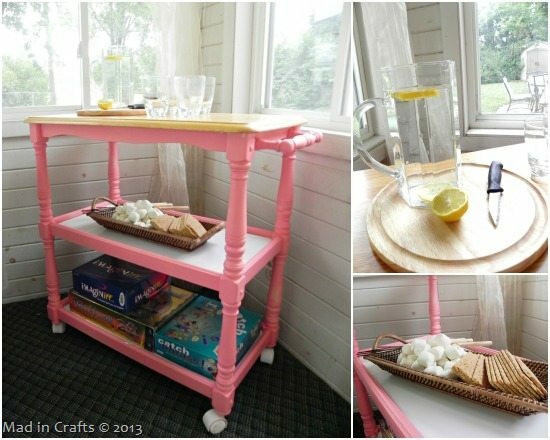 The bar cart will also be helpful when we have guests over, since we can load it up and wheel it out to the patio when it’s needed. The last corner features another comfy armchair and a cozy throw blanket. The doors to the right lead into our big toy room. It isn’t a very picturesque transition right now, but when the kids outgrow the toys, it will become a family room. The french doors both swing all the way around into the toy room, so the two spaces can become one large living space. 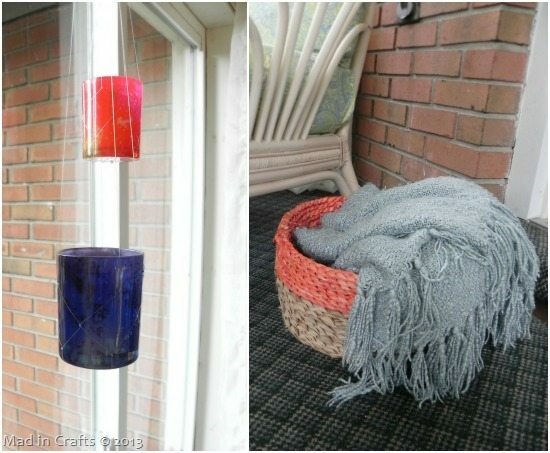 Both the candles holders hanging in invisible macramé and the color-blocked basket are Target Threshold pieces I found at Goodwill. I don’t know if no one in my area likes the Threshold collection or what, but I am more than happy to keep picking up the leftovers at Goodwill for cheap! You can’t easily tell from these pictures, but the sheers hanging from the DIY curtain rods and hardware are actually mismatched fabrics. It would have cost me a small fortune to buy curtains for all these windows. Fortunately, I was bequeathed a huge stash of fabric a while back that contained yards of different sheer off-white fabric. I was able to sew enough curtains for the room using the various types of fabric, and I actually really dig the fact that they go, but don’t match. 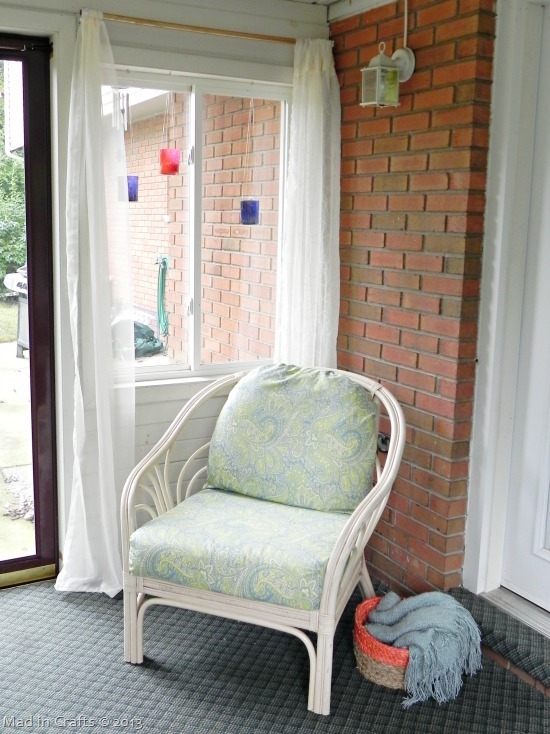 I am really glad it all worked out, because I think the curtains are what make the space look more like a part of the house, instead of just a porch with furniture in it. I am so pleased with the way the room looks now; I think it has perfectly fulfilled its potential. It is a great space for quiet reading, screen-free family time, or for entertaining friends. 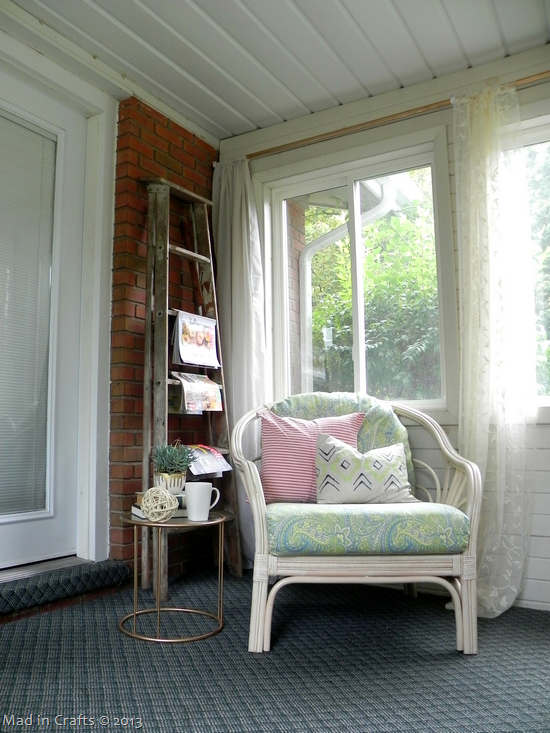 The sunroom might end up being my favorite room in the house now since it provides all the good aspects of being outside without the nasty bother of having to actually BE outside. What do you think? 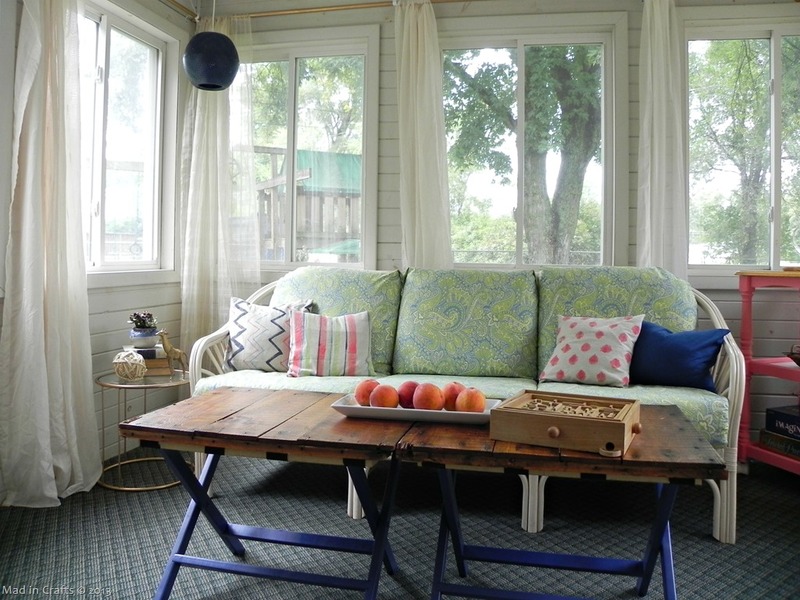 Is this your favorite Mad House room makeover or do you have a different favorite?